04 Feb 2019 --- When it comes to processing coffee beans, longer fermentation times may result in a better taste. This is according to Luc De Vuyst, M.Sc., Ph.D., Professor of Industrial Microbiology and Food Biotechnology, Vrije Universiteit Brussel, Belgium. Lactic acid bacteria also play a positive role in this process and other species of microbes may contribute. However, more investigation is needed in this area, according to the research, which was published in Applied and Environmental Microbiology. “A cup of coffee is the final product of a complex chain of operations including farming, post-harvest processing, roasting and brewing,” says Dr. De Vuyst. “There are several variants of post-harvest processing, among which wet processing and dry processing are the most common.” Wet processing – commonly used for Arabica and specialty coffees – is the step that includes fermentation. Fermentation was of particular importance. During extended fermentation, a genus of lactic acid bacteria used in the fermentation of cabbage to sauerkraut and sourdough starters called leuconostocs declined in favor of lactobacilli, according to Dr. De Vuyst. Lactic acid bacteria were already present before fermentation, and these acid tolerant lactobacilli increased even more during this process, he adds. 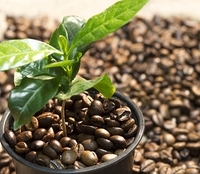 “Nevertheless, it is challenging to draw a causal link between the microbiota and the volatile compounds in the beans – those compounds that contribute to the coffee's smell – since many of these compounds can be of microbial, endogenous bean metabolism, or chemical origin,” he explains. “Furthermore, there is a build-up of the fermentation-related metabolites onto the coffee beans, which affects the quality of the green coffee beans and hence the sensory quality of the coffees brewed from there,” Dr. De Vuyst states. He also emphasized that how each stage of processing influences the taste of coffee remains mostly uncharted. “We were aware of many different microorganisms during wet coffee fermentation – enterobacteria, lactic acid bacteria, yeasts, acetic acid bacteria, bacilli and filamentous fungi,” Dr. De Vuyst says, but it is still unknown how most bacteria influence this process. The work was a collaboration between the Vrije Universiteit Brussel and the Nestlé Research Center. “Nestlé was interested in the fundamental aspects of coffee processing, in particular, the post-harvest processing chain, to correlate it with the roasting process and of course the final cup quality,” he concludes.